When I was preparing for Hawaii, I knew I wanted to make a few new beach coverups. I’ve made a few in the past (this romper being one of my favorites), but of course I wanted something new for our trip. I spotted Julia from Gal Meets Glam in this gorgeous coverup, and was instantly inspired. And, as luck would have it, my local fabric shop had a beautiful lightweight rayon in this perfect light teal — obviously I had to make it. The best part is that it came together so easily and it’s a super quick project. You’ll be beach ready in no time! click through for the instructions! 2 yards lightweight fabric – more or less depending on your size, and how long you want your coverup (mine is a rayon that I picked up at a local fabric spot. It has no stretch, but a fabric with stretch works great too). 4. Measure your neck-hole opening and cut a piece of your neckline trim so size. Pin in place around the neckline and then sew in place with matching thread. Then hem the entire circumference of the coverup with matching thread. 5. Once the entire coverup is hemmed, pin the pom pom trim around the circumference, then sew in place with matching thread. 6. Finally, fold the coverup in half and do two small stitches on either side, under the armpit. These little stitches will keep the coverup from sliding around when you wear it, and keep the sides from being completely open and exposing. Press all your seams, and you’re done! That is so cute!! I love the colors you chose. You are so so so talented!! That is the cutest cover up ever. I love turquoise and pink together! I personally don’t wear bathing suits, but this is the cutest cover up I’ve ever seen! I adore the pom poms. Where do you shop locally for your fabric? I spotted Julia’s cover up too and bookmarked it so as to DIY!! Now I have yours as well and now I don’t have to wonder what template I should use for the cover up! OMG, this is so awesome! I need to make this ASAP! This is better than Julia’s! You are so creative, I am jealous!!! Yesssss! I’m so excited to make this! 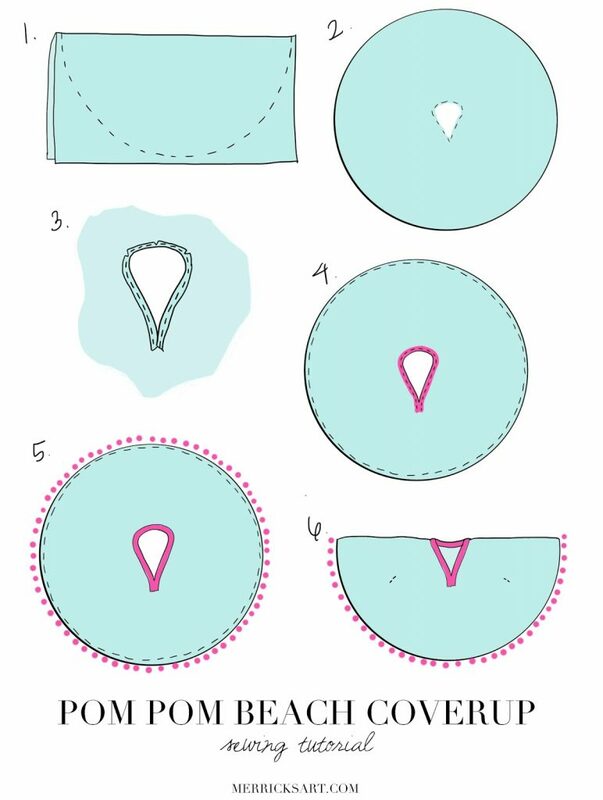 I’ve seriously been sewing up a storm this week – I LOVE your tutorials! I love this! I think I am going to leave work now and search for material and get started! We are going to Catalina for girls camp this Summer, “Anchored in Faith”. I am SO making this!! Thank you for the tutorial and inspiring pictures. I am off to M&L tomorrow! I cant wait to try this! It seems so simple and looks darling. I’ve been enjoying your DIY’s of Gal Meet Glam lately. I love her blog/clothing but cant afford it. It’s really great that I can make it with your tutorials. Thanks! Can’t wait to try to make this for the summer. I discovered your blog via Alyson over at The Average Girl’s Guide and I’m so happy that I did! This is so incredible and you look gorgeous! This is so great! Question: did you use 45 inch wide fabric or 60 inch wide fabric? Oh, good question! Sorry I didn’t mention that above. Mine was 60 inch! This is sooo cute! btw did you know that this cover up is sold on amazon? They even have your pictures. Just fyi in case you didn’t know. Thanks for the heads up — I didn’t know! I have contacted amazon about getting my photos taken down. Thanks a ton! How big is the initial circle you made in #1? Oh, good. I just came over here too to tell you that I saw you on Amazon (that must be surreal, huh? ), but I see that you’ve already been notified. Good luck! I looooove this! How much trim did you need around the neck? Is a yard enough? I can’t remember how much I used, but I think a yard should be totally fine! opps! I completely forgot to write the trim around the *collar ? I found it at a local shop just in the trim section — I have no idea what it was called, I’m sorry! Just saw your pictures being used on the site called rosegal.com under the swimsuit section. Yikes. How can they just use your pics like that!?!? Just saw this one on my facebook feed. Just saw this one tonight. I also just found this one. These are all the cheapo sites that come up in my fb feed. Hi! I had saved your pin on pinterest for a cover up project and just happened to be scrolling on groopdealz and saw your exact same picture! I saw that someone has just commented this but wanted to let you know I contacted the seller SWIS to notify them that these are clearly your photos and not theirs as they are claiming. Here is there site: http://staywarminstyle.com I didn’t see the cover up on their website but just on Groopdealz to be sold for $15.99 and here is that link: https://www.groopdealz.com/deal/pom-pom-trim-cover-up-/60557 Hope this helps! getting a huge order of fabrics in soon, and I need to try this!!! You said to use 2 yards for the initial circle. But if I were to measure from wrist to wrist and add about 1.5″ allowing for hems, do you think that would work too? yes, that should be fine! Good luck! Do you know approx. the measurement of the neck opening? myself …I am too large. About how large of a hole did you cut for the neck opening? Thank you! Saw it two days ago, finished today. Added snaps at the shoulder to fold in the sleeves, too! Made my own using black and white polka dot fabric! Also just noticed another site using your photo: shopjanenow.com. It’s on their Instagram and looks like they’re selling the caftan as well according to their instagram. for taking time sharing it with us. I really enjoyed reading your post. LOVE! If I wanted to make it a little bit longer in the back and front to make sure it covers up my ample booty, any suggestions on going about doing that? Just make it more oval, instead of circular! thanks! I’m going to try it! A websit called cupshe is using your pictures to sell this exact cover. Hello! Just so you know, I run into this page that is using your design (and picture) for commercial purposes with no due credit, and probably without your permission. They probably all are copying the original Neiman Marcus design! Hi — I love this — You said you used Rayon — would Chiffon work or possibly a Jersey Knit? Just curious trying to get some options here. Thanks. yes, either would work! In fact, the rayon gets really wrinkly, so either of those options might be better as far as wrinkles go! This looks really cute. I am a beginner sewer and just started learning how to use a seeing machine. Is this a good “first project ” for me and my daughter? Make the notches before. It helps the rounded edge fold down easily — otherwise it will pucker. You can use fabric glue, but I’d recommend a sewing machine. Thanks. Someone else suggests that too and to iron it afterwards, then fold it over and you may not have to pin it. I was thinking of seeing anyway, it will be better. I just thought maybe the fabric glue would work but probably not strong enough for it too last. That stuff is better with crafts. I just need to find the right color. I was thinking of using gauze. Did you wash your fabric first too? I heard with most things you wear that you should. I used rayon for this project, which is hand-wash or dry clean only, so I didn’t prewash it. But I prewash most of my fabrics if they’re machine washable! Thank you for getting back to me so quickly. I appreciate it. I am taking a sewing 101 class at JoAnnes and a excited about it. I got a Singer Stylist for my b’day and looking forward to using it on that. I just need to find the right fabric and color. I was going to practice first. I bought two yards of cotton material I thought I might experiment on. Sorry but one other question. Did you turn the fabric inside out when you made the notches and sewed the collar first? I I know you work on the opposite side a lot with sewing. I know you do the trim right side out but wanted to check first. Thanks. In all my tutorials I show right side and wrong side of the fabric with different colors. You can see in step 3 of this tutorial I’m working on the wrong side of the fabric. Sad how people do this! On a lighter note, any tips for sewing a perfect round hem? Hi Merrick – on the fold which way is the selvage? I have 2 yards of fabric at 48″ wide (I think from memory) it just doesn’t look right before I cut. Thanks! The selvage edge should probably be along the bottom. Honestly I can’t remember on mine! What size pompous did you use. I saw some at JoAnnes and they wanted $12 a yard for 1 1/8 inch. I saw some at Hobby Lobby that was 3/8 of an inch and a lot less. Itis more like Rainbow loop trim. Do you think that would work too? I am going to use white gauze for materiel and I found some trim that is s half inch. I’m not sure what the measurements are…is the 1 1/8 you found at Jo-Ann’s measuring the pom pom itself? Or the trim from top to bottom? Regardless, I think any size of pom pom would work great! The 3/8″ will look great, I’m sure. I made this for my daughter and it turned out great! I folded the 2 yards across the width of the fabric so the selvage edges were along both sides. We couldn’t find pompoms we could afford so we used a wide lace on the edge. Also, instead of folding under and notching the neck edge, I used bias tape and sandwiched the raw edge into the bias tape and used a decorative stitch on my machine to sew it down. Turned out cute! Thanks for the tutorial! Merrick I think you should put in your tutorial that you used 60 inch wide material. I ended up ruining the material I was going to use because it was too short. I folded it with the salvage side on the sides and my material was 44 inches wide. We made a perfect circle, cut the neck and it was way too short. This may help other people as well. I cut mine about 10 inches in diameter! I saw this product and noticed one of the designs looked like you … and it looks like they took your picture and altered it so it comes off as their product. Not sure if you were already aware of this but wanted to let you know! What would you recommend using for the trim on the neck line and how much? Any kind of thick braided trim will do, and you’ll probably need about 1 yard! I absolutely love this cover up. How did you sew the neckline, SPECIFICALLY the bottom of the neck line? I tried to sew mine but it just turned out as a circle neckline opening. when you first folded the fabric to cut did you do it length wise (the way the fabric was cut) or did you fold it width wise? Does that make sense. Im just confused how to get the right length. how tall are you?